Crab salad, along with Olivier, Greek and Caesar salad for many years is a regular at not only weddings, but for everyday dinners. The required ingredients can easily be found in the nearest supermarket. In addition, it does not require special culinary skills and a large amount of free time for cooking. To prepare crab salad, you first need to boil the rice. To do this, wash it in running water until, until it becomes transparent. Then put the rice in a saucepan, cover with water and place on high heat. When the water boils, reduce heat to medium and cook rice, stirring occasionally, so it does not stick to the bottom. Choose parboiled rice. When cooked it sticks together and turns crumbly. Cooked rice, fold in a colander and rinse in cool running water. Place eggs in a pot or bucket, cover with water and bring to a boil over high heat for 8-9 minutes from the moment of boiling water. Pour the eggs with cold water, otherwise there is a risk that the shell will burst. After the required time, the hot water from the pan, drain and add cold eggs to cool down faster and better to clean. Let sit for 2-3 minutes. Then boiled eggs, remove from water and peel off the shell. Cut into small cubes. Crab sticks peel from individual plastic sheath. Cut into small cubes. For this salad you can also use crab meat sold in vacuum packaging. Onions clean from the husk. Cucumbers, dill and onions, rinse in cool running water. Cucumber peel off thick skin. Cut into small cubes. If desired, fresh cucumbers, you can replace the salt. This will give the salad a piquancy. Onions and dill finely chop. 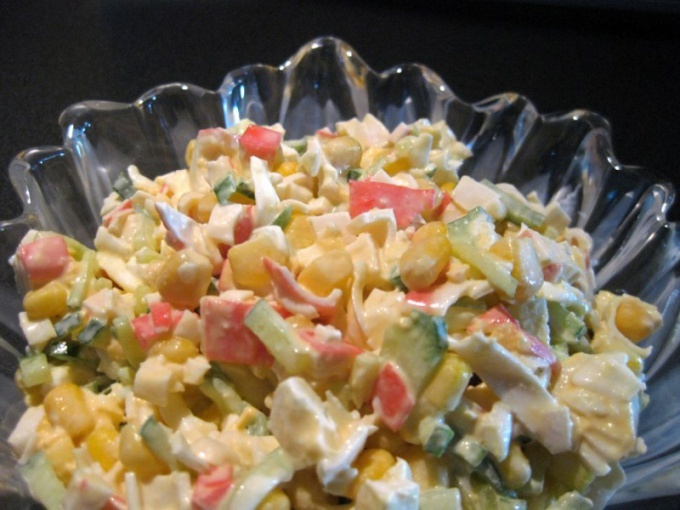 In a bowl, put boiled rice, chopped eggs, crab sticks, cucumbers, onions and dill. Add the corn. Mix thoroughly. Before serving, add salt and mayonnaise. Mix. Prepared crab salad serve with your favorite dishes. It goes well with fried or roasted potatoes, chicken, chops, fritters from the liver, etc. To store for a long time crab salad not because it contains chopped onions, which can give an unpleasant smell to the dish.